A herd of pigs in Canada has tested positive for swine flu, apparently after being infected by a farm worker recently returned from Mexico. The herd, in the western province of Alberta, has been quarantined. Officials said there was no risk of contracting the illness by consuming pork, and chances of a human getting infected by a pig were remote. Meanwhile a spate of new cases among humans were confirmed in Canada, raising the total number from 35 to 85. The largest number of cases was in Nova Scotia. Many of them were at a school in the town of Windsor where an outbreak earlier in the week led to Canada's first cases of secondary transmission of the virus. Brian Evans, a senior official from Canada's food safety agency, told journalists up to 200 pigs had been infected at the Alberta farm. Both the man and the pigs were recovering, he added, saying that the virus did not seem to have spread beyond the farm. "I want to be clear - there is no food safety concern related to this finding," he said. 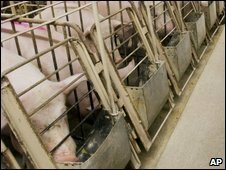 US Agriculture Secretary Tom Vilsack said he was satisfied that Canada had taken all necessary measures to contain the outbreak, adding that there were no cases of infected pigs in the US.